Worthington Lake care home Standish has an incredible team of staff who came together this Christmas to hand out hot drinks, home made soup and mince pies to the homeless in the centre of Wigan, they spent their day handing out hot drinks and pies as well as hats, scarves and gloves that had been knitted and donated by Springfield Nursing home in Coppull. 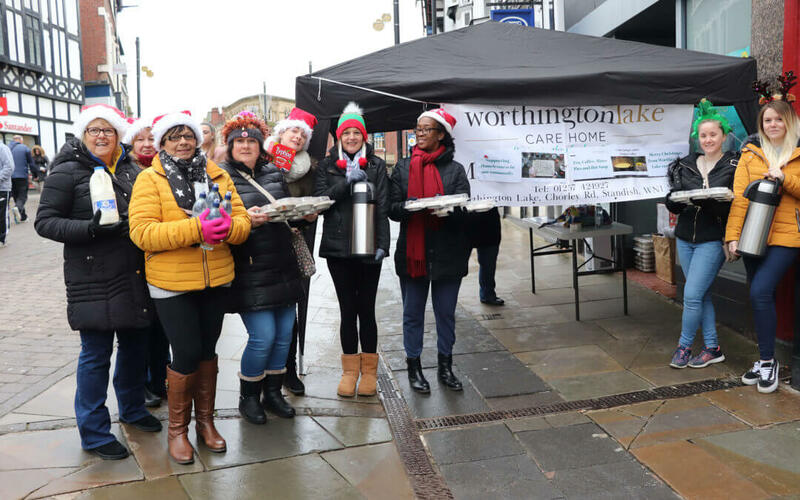 Worthington Lake care home is due to open early 2019, the new team of staff who have spent a few weeks in training together decided to do something meaningful in the lead up to Christmas so they set up a soup kitchen in the middle of Wigan town on a cold, wet and windy day. The Worthignton Lake team wanted to spread Christmas cheer in their community and they did just that with over 100 mince pies given out as well hot drinks. Passers by and shop owners praised the team for what they were doing and even started giving donations so the girls could either buy more stock or give money The Brick homeless shelter. 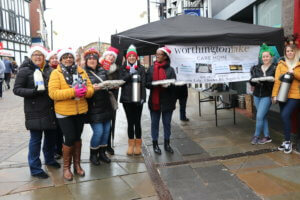 The team set up a marquee with a banner outside the EE shop in the center, and carried over flasks full of hot drinks and soup as well as a huge pile of mince pies that had been kindly donated by Costco. The first visitor to the marquee was Lee Jones, Lee explained he had become homeless after loosing both of his parents suddenly in June last year, Lee stayed under the marquee out of the rain for over an hour chatting to the girls from Worthington Lake care home. Katy Grindley “It felt really good helping today, Lee will remember this day and so will i, he was laughing and joking with us and kept coming back throughout the day. Krystyna Bylinski donated her own snood to a homeless girl in a doorway, Debbie Fogg gave her gloves away. Other members of the team include Jennifer Grant and Ffion Dent. As well as being able to give their time to be in the cold for the day they also managed to raise £117 for The Brick homeless charity which will but put with han extra £185 raised earlier in the year when Worthignton Lake hosted a Halloween Makers Market welcoming the community to get a first glimpse of what the home will look like over looking the beautiful Worthington Lake in Standish. Starbucks helped the team throughout the day allowing them to refill their flasks of hot water as well as offering chairs and napkins.